Today I had a great rehearsal with the Jazz Connexion Big Band, my reading is finally getting to the stage where I can enjoying it and I was really in the zone for one of my solos in Groovin’ High, a bebop tune that we’re doing a fast samba arrangement of. I’ve been thinking more about the differences between composition and improvisation. I’m not sure why it’s important yet but I think it might unlock some interesting territory when it comes to how we play our instruments, our mindset and attitude. While improvisation is an ongoing dialogue with others, and is usually based on communication from the very moment it starts, with other improvisers, the audience or even the physical space you’re in. Composing music on the other hand tends to be an individual experience until just before it is performed. Sure, many co-write with others but the act of composition is usually a solitary one. An improviser works with spontaneity and intuition in real-time, unable to change what has been played. But composers can plan the length and timing of every nuanced articulation in a musical structure if they want to, then change their mind and move sections around. 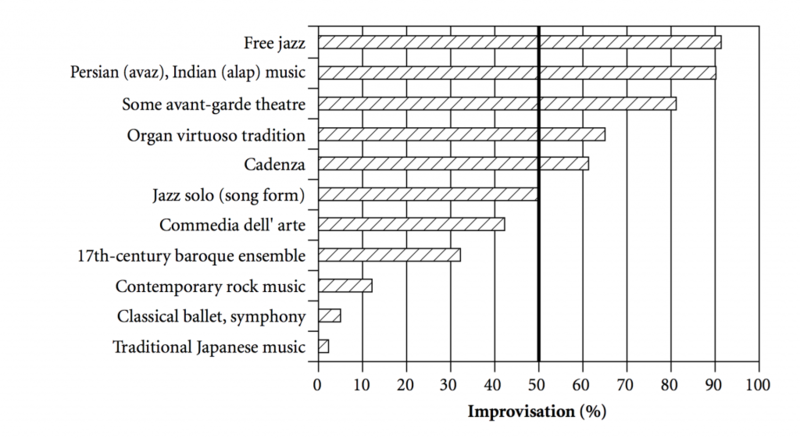 In Brian Eno’s article “Generating and Organizing Variety in the Arts” (1981), he describes a “scale of orientation” or continuum from right to left between composition “tending to subdue variety in performance” -predetermined music – for example: prerecorded electronic music on the extreme right, and composition “tending to encourage variety in performance” – free improvisation, on the extreme left. In between we find all the facets from classical music, various folk musics to jazz, free jazz etc. As I search for differences between composition and improvisation many examples come to mind of masterful improvisors that composed intricate melodies while improvising, like Charlie Parker, as I mentioned in Research Note 004. There’s a lot more to say about this but I’ll leave that for another day. What do you think the biggest difference are?